After getting a fair picture of the Sun with my 6″ reflector and DSLR, the next logical target is the Moon! Had a great opportunity to try this out with last week’s Lunar Eclipse. 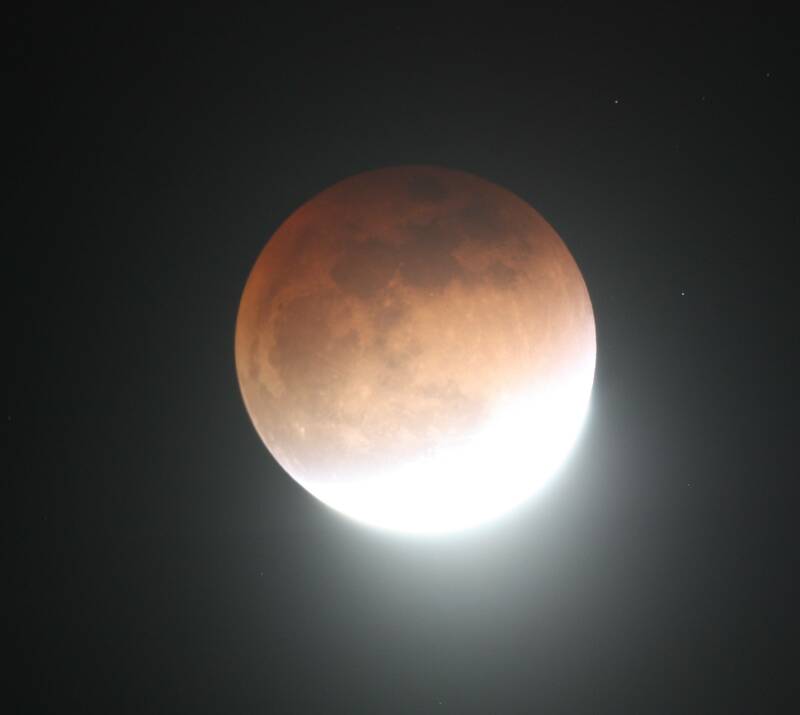 And this was not just any eclipse, but the widely touted #SuperBloodMoon eclipse of the century. There are some interesting facts behind this sensational term and the hype around the event, so let’s break this down a bit. A lunar eclipse occurs when the Moon passes behind the Earth at night and falls into the Earth’s shadow. Of course, the “moonlight” we see at night (or during the day) is actually sunlight striking the “daytime” portion of the Moon. When the Moon is directly behind the Earth, we see the whole daytime face and it appears as a Full Moon. When the Moon is to either side of the Earth we see half of it’s lighted surface at the First and Last Quarter. When the Moon is in front of the Earth, it is light on “far side” of the moon, so we normally cant see the “New Moon” when is is up during the day – unless it happens to cross in front of the Sun in a Solar Eclipse. Note that a “day” on the Moon lasts about 28 days as it rotates once around the Earth. So you may ask, why doesn’t a Lunar Eclipse happen every month, when the Moon goes behind the Earth? One factor is the relative scale of the bodies. As illustrated in the great video To Scale: The Solar System mentioned previously, the Moon is quite a ways off from the Earth relative to its size. The Moon is about 3500 km across and orbits around the Earth at 380,000 km on the average. So if you have a model of the Moon and hold it at an arm’s length away (about 1m) it would be a bit less than 1 cm across at that scale – pretty small! The Earth is about 12,750 km across or 3.5 times larger – so it would be around 3 cm across at this scale. So the Moon really has to be directly behind the Earth to fall into its shadow. Put another way, the Moon takes up about 1/2 a degree of arc when viewed from Earth, which turns out to be about the same arc angle as the Sun. (An important fact for Solar Eclipses). The Earth viewed from the Moon would be about 1.8 degrees across, so it casts a larger shadow then the Moon does on Earth. The other factor behind the frequency of the Lunar Eclipse is the inclination of the Moon’s orbit around the Earth – which is a good 5 degrees. So while the Moon is traveling around us, it is also moving up and down relative to the Earth’s track around the Sun, so it will be in sunlight nearly all of the time, even when it’s behind the Earth at the Full Moon. The apparent path the Moon takes across our sky follows the path the Sun takes (the Ecliptic) which rises higher in the Summer and sinks lower in the Winter. But the Moon will wander 5 degrees up and down from that path, so it can get quite low and high in the sky when viewed month to month. The Moon will cross the Ecliptic twice a month and if it does so right when it is directly behind the Earth it will fall into the Earth’s shadow – and this is the Lunar Eclipse. If the Moon is directly behind the Earth this will result in a Total Lunar Eclipse but this occurs in stages. First, the Moon starts to enter the Earth’s shadow and the Sun is partially blocked. This will result in a dimming of the Moon’s brightness in this phase, called the Penumbra. A while later, an observer on the Moon at the leading edge of the Eclipse will see the Sun totally covered and that area of the Moon will go dark. The shadow continues across the Moon until it is completely covered at totality, and this can last some time as the Earth is larger than the Moon. Eventually the Sun re-appears on the leading edge and the Moon moves out of shadow and back into full sunlight. If the Moon’s path is a off-center when it passes behind the Earth it can result in a Partial eclipse where the Moon is partially in darkness. Even farther off center you can have a Penumbral eclipse where the Moon is just dimmed, though this is pretty unusual. A picture is worth a thousand words here, so this excellent page on Lunar Eclipses illustrates the different cases nicely. During a total lunar eclipse, the Moon is not totally dark but often visible with a faint reddish glow. This is because the Earth has an atmosphere which refracts some light around and behind the Earth. The light is reddish due to Rayleigh scattering, which makes the sky blue and the sunrise and sunset red. So some of that red light is passing through the sky, hitting the Moon and bouncing back to us! The color and brightness of the Moon at totality can vary with the amount of dust or ash in the Earth’s atmosphere, and also the distance of the Moon. The Moon’s orbit is fairly eccentric and its distance can range from about 360,000 to 400,000 km. During last week’s eclipse, the Moon was also at Perigee – at the closest value above. At perigee, the Moon is about 5% closer and would have about 10% more area and brightness. This is the Super Moon, as it’s become to be known of late. Last Sunday, the weather was quite nice all day but forecasters were calling for clouds to set in for my area. So I wasn’t sure whether or not to setup my telescope to try getting some pictures. It still looked very nice in the evening, so I quickly setup on my deck where I had taken a picture of the Sun – not thinking that the Sun is not visible there until late in the morning! So when the Eclipse did arrive it was quite spectacular but hidden well behind the trees. The Moon did poke out at the back end of the eclipse when it started to get bright again. So I took a number of shots, focusing through the viewfinder. A shot at 1/4 second just showed the bright edge, so I increased exposure to 8 seconds and decreased down as the Moon continued to brighten. Ok, not too bad for a first try! So we saw that the Moon was a “Super Moon” on that night, but what’s up with Blood Moon? 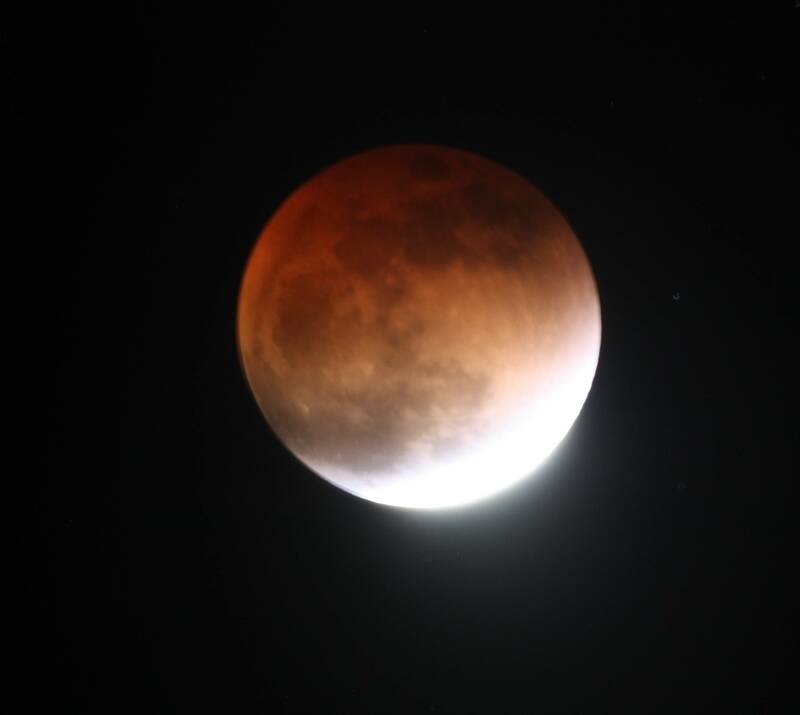 Turns out this past Lunar Eclipse was the 4th total eclipse in a row, completing a Lunar Tetrad. This is fairly rare but happens from time to time. And it turned out that this Tetrad happened to start and end around religious holidays, so some have taken this event as a portent of End Times. Personally, I don’t care too much about what folks believe along these lines, so long as they leave others alone who choose not to! In any case I’m glad we survived this event and the killer comet advertised last month as well. But the next time we have this sequence of lunar events in 2032-33, can’t we just call it a #RecurringTotalLunarEclipseAtPerigee?